Japan’s shotengais – partly enclosed markets – succeed both because of their proximity to transport and the unique, tightly knit communities they foster. Photo by Michael Vito/Flickr. Even as malls are declining as social spaces in the United States, shotengais (商店街) – pedestrianized business districts covered with translucent roofs – remain a part of everyday life in Japanese cities. Shotengais are generally located near transport hubs and set directly on commuting corridors, allowing people to get food and amenities without disrupting their daily routine. Shotengais typically contain locally owned shops as opposed to large commercial outlets, reflecting the culture and the specific needs of the local population. 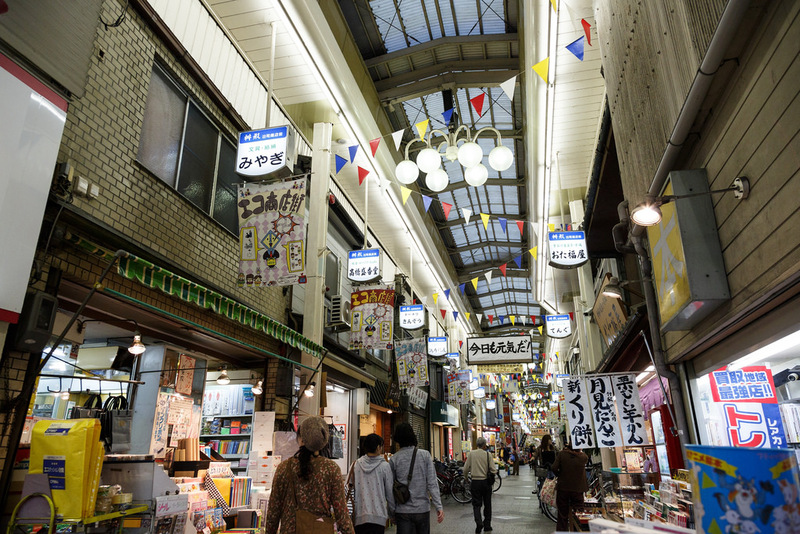 Shotengai managers’ attention to creating vibrant and unique spaces and locating near transport hubs are likely two key factors in their continued success. Struggling malls in around the world should sit up and take note, while developing cities should think, what kind of interactions do we want to create between residents and business owners, or between people and the products they buy? Both the way people move throughout shotengais as well as the way in which shotengais are connected to the city at large contributes to their commercial success. With bike racks at the entrance, visitors have the option to either walk or bike in the shotengai. Motor vehicles, however, are strictly prohibited. This walkability makes it easier for visitors to get the suggested 30 minutes of daily physical activity recommended by the World Health Organization (WHO). Moreover, Shotengais help to support a healthy lifestyle, allowing shoppers to pick up fresh food daily rather than buying frozen and pre-packaged food. And this lifestyle of walking daily and eating fresh food seems to be working: while obesity in United States is above 30%, in Japan it is only 3.5%. Furthermore, because most residents of Japanese cities live within a fifteen-minute walk of a shotengai, and shotengais are generally located near transport hubs, this mixed-use and compact development has contributed to Japan’s incredibly low car rate of car ownership. People wander up and down the different stores in the early evening at the Demachi Masugata Shōtenga. Photo by Mark Vito/Flickr. Shotengais are not an aggregation of chain stores, but places with unique character that reflects the surrounding communities’ wants and needs. 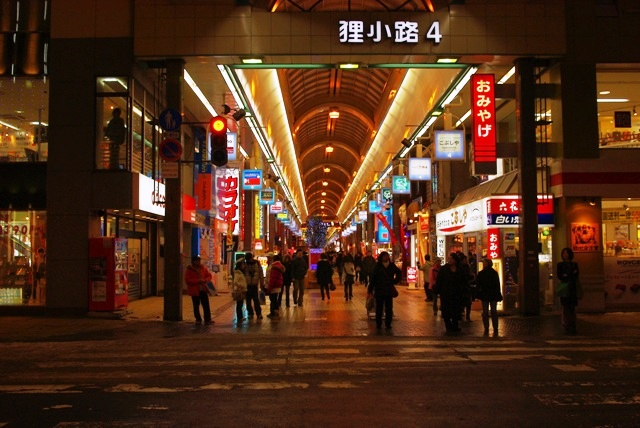 Shotengais offer takeout sushi, barbeques, sit-down restaurants, magazine and book stores, supermarkets that sell fresh produce, clothing shops, flower shops, fast food chains, game centers, massage stores, beauty shops, and small home appliances all along one street. Although most shotengais have staple food vendors, each one is different based on the needs of the community. Shotengais that are situated near universities, for example, have more entertainment options, whereas shotengais near residential districts offer more food options. Shotengais also serve the community by opening early and staying open late, allowing late night workers who rely on transit to find somewhere to eat late at night. Having this continual commercial area open also ensures that there are continual eyes on the street, keeping community members safe and connected. Lately, shotengais have become more tech-savvy, with websites that contains interactive maps and show different types of shops and activities by category. However, they still retain their own individual character. In the physical businesses, owners put up vivid signs and decorations, such as lanterns, signs, and flags that become a glowing, surreal collage as they light up at night. Shop owners often dress in traditional-styled costumes or uniforms and greet visitors, often quite loudly. But these noises become a part of the experience, a dialogue between buyers and sellers, between commerce and transport, and between people and their city. 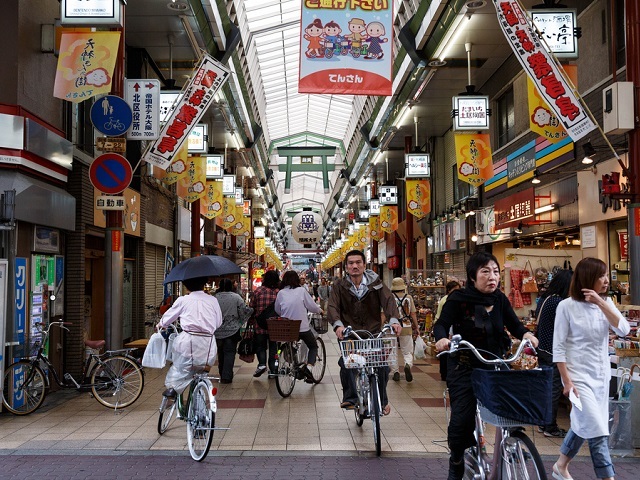 Although Japan has built several more ‘modern’ malls over the decades, the shotengais’ contributions to sense of place and their contributions to walkable, healthy lifestyles means these community and commercial havens are unlikely to go out of style any time soon. Still busy late at night, the famous tanuki koji shotengai is connected to the largest transit stop, odori station, through an underground walkway. Photo by Wikimedia.